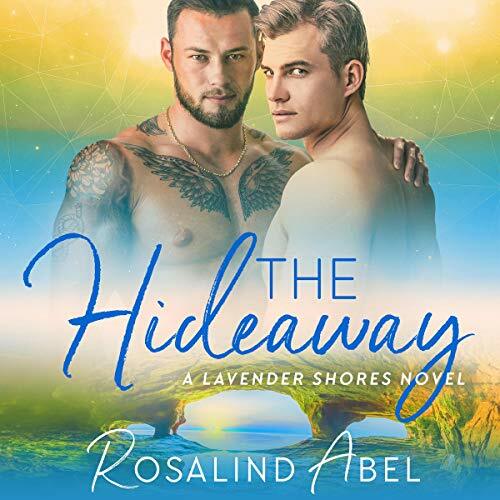 Dana and Erryn review The Hideaway (Lavender Shores Book 5) by Rosalind Abel (Published by Wings of Ink Publications, November 7, 2017, 266 pages). The audiobook was released January 4, 2019. It is narrated by Kirt Graves and runs 8 hrs and 4 mins. A copy was provided in exchange for an honest review. To read the review for The Palisade (Lavender Shores Book 1) click here. To read the review for The Garden (Lavender Shores Book 2) click here. To read the review of The Veranda (Lavender Shores Book 3) click here. To read the review for The Shipwreck (Lavender Shores Book 4) click here. To read the review of The Hideaway (Lavender Shores Book 5) click here. To read the review of The Glasshouse (Lavender Shores Book 6) click here. To read the review of The Alcove (Lavender Shores Book 7) click here. To read the review of The Wilderness (Lavender Shores Book 8) click here. To read the review of The Victorian (Lavender Shores Book 9) click here. To read the review for The Garden Audiobook (Lavender Shores Book 2) click here. Lavender Shores’ resident tattoo artist Connor Clark looks the part – six-foot-six, muscle-bound, and covered in ink – and most definitely doesn’t blend in. Grafted into the Bryant family as a teenager to escape his abusive father, the Bryants saved his life, but Connor has never truly felt a part of the founding family royalty. And if his heart’s desire were revealed, it would betray everything the Bryants have done for him. Micah Bryant was born with a silver spoon in his mouth. He’s always had everything he ever wanted – save the one he desires most. Even moving to New York City for a few years didn’t dampen his passion – not that Micah had expected it to. He’s known his destiny since he was nine years old, the moment it had walked through his door. After years of longing, years of secrets, and stolen moments of passion and love, Connor weakens enough to allow the town to see how he feels and lets the Bryants know his love for Micah is anything but brotherly. But no sooner had the decision been made than Connor’s biological family returns and shatters it all. Still, Micah holds on to the belief that their romance was written in the stars, but maybe he’d been wrong all those years…. I usually don’t write reviews for audiobooks if I already reviewed the ebook. I’m always afraid that I won’t come up with something original to say. It has been over a year though, so I took a chance and joined in a co-review. I bought this audiobook because it was one of my favorites in the series. Kirt Graves also does an awesome job bringing the story to life. He is very good at emoting and differentiates the characters voices well. I am a fan of taboo/forbidden romances. I have read a couple mm romances that featured real brothers, so step brothers doesn’t actually feel that taboo to me. This story is obviously not about me, though, so for Micah and Connor being step brothers in love is a bit more of a disaster in the making. For one brother in particular. Micah is Lavender Shores royalty, born to one of the founding families. I love Micah. He is an accomplished musician who loves farming and working the land. He is a character to envy because he is secure in who he is. He knows what he wants, even when his family all try to second guess his decisions. He is also confident in who he wants. He has loved Connor for nearly a decade, even if any possible relationship with him is on an indefinite hold. His love is true (though he has dated other guys) and that is respectable. The one downside is he sees everything through the rose-colored glasses of being a Bryant. Connor has been living with his best friend Gilbert’s family since high school. While he knows they love him, there is part of him that will always remember that he wasn’t born a Bryant. He worries that if they discover his feelings for Micah, he doesn’t just disappoint them, he could possibly lose his family. His fears only increase when his nephew moves in with him and he has the responsibility of teaching him that being gay doesn’t make him a bad person and having a relationship with his step brother seems counterproductive. It is so complicated for him to just give in to his feelings in ways that Micah can never understand. And yet….The two have amazing chemistry and I just love the both of them. It’s hard to see them flounder and fight what comes natural for them. The secondary characters of the Lavender Shores residents are awesome as always. Micah’s mom is crazy and flamboyant but her heart is astounding and you can see why the men are as good as they are. I’ve already read a lot of the single characters stories, but there are still I can’t wait to see find love, especially Connor’s nephew. I want to see him completely let go of the things his family taught him before he moved to Lavender Shores. I love the town and the people in it, and this is one of my favorite series. I definitely recommend it. I love being transported into Lavender Shores every few months. Between Rosalind Abel’s words and Kirt Graves’ narration, I feel like I’m in another time and place. Somewhere far away from the world of intolerance and hate. Of homophobia and racism. Of a place where being a bigot is a badge of honor. Lavender Shores is the antithesis of that world and although it is unrealistically wonderful, it still gives me hope of what the world could one day look like. Like a place where everyone is embraced, no matter who they are and no matter where they’ve come from. Aspirational and inspirational at the same time. This is the fifth audio in the series and, like always, I’m in love. This time it’s with two of the men from the founding Bryant family. There are five founding families and the website has family trees if you’re interested in those things. For this story, the other families are in the background. For this story, it’s a personal journey for Micah Bryant and Connor Clark. One has always belonged to the family and to Lavender Shores and the other was brought into the family as a young man of just thirteen who was abandoned by his devoutly religious family who were convinced if he didn’t change who he was, he’d be condemned to Hell. But his identity as a gay man, is as much a part of his self as the color of this hair and eyes. The tattoos came later, but even they have great significance. Micah Bryant is in many ways Connor’s opposite. He also is gay but has been raised in a loving family and always accepted for who he is. That loving family is still wonderful, but they are constantly nagging him to leave Lavender Shores again and take up his music in New York. He’s a talented violinist who walked away from a successful career in order to come home to the place he loves. To the man he loves. Because although Lavender Shores, and the Bryants in particular, view Micah and Connor as brothers, they are not so in their own eyes. Both understand revealing their loving relationship will cause heartache and distress, but Micah has convinced Connor that it’s worth the risk. Until Connor’s past rears its’ ugly head and the men are forced to put their relationship on hold. I love these two men. Both tried to make a life apart, but both are so much stronger with the other in his life. It’s a kind of love I can envy. The strength of the bond gives them a reason to reveal everything to those whom they love and who love them. The hideaway in this story is described in amazing detail and I can see Micah playing his violin down there. Hidden away from the world, but always waiting there for Connor. As I’ve said, Kirt Graves is doing a fantastic job at narrating the series and this book is no exception. I highly recommend it. And as I said in my review of the book, if you haven’t read the books, no worries. This one stands alone, but like a good meal, is better enjoyed with friends. This looks great. I would love to read more. I’m a huge fan of Kirt Grave’s narrations, he truly does bring books and characters to life, so I’m happy that he did so with this one as well. There are such great characters in this series, and I love getting glimpses of all of them throughout the various books. Thanks for the reviews!